With this issue, we've reached another milestone. Before The Fantastic Four #1, the majority of Marvel's comics at the time (maybe all of them?) were anthology books. Then superheroes arrived on the scene, and Stan started up a couple of new titles (FF, The Incredible Hulk, and some months later The Amazing Spider-Man) which were devoted entirely to one hero or team. At the same time, he created new heroes to take up residence in the anthology books, so Thor was the first story in each issue of Journey into Mystery, Iron Man kicked off each issue of Tales of Suspense, and the FF's Human Torch had solo adventures at the start of every new Strange Tales, with 2-4 unrelated and non-continuing backup stories still filling out the remainder of the pages; anthologies these books remained. 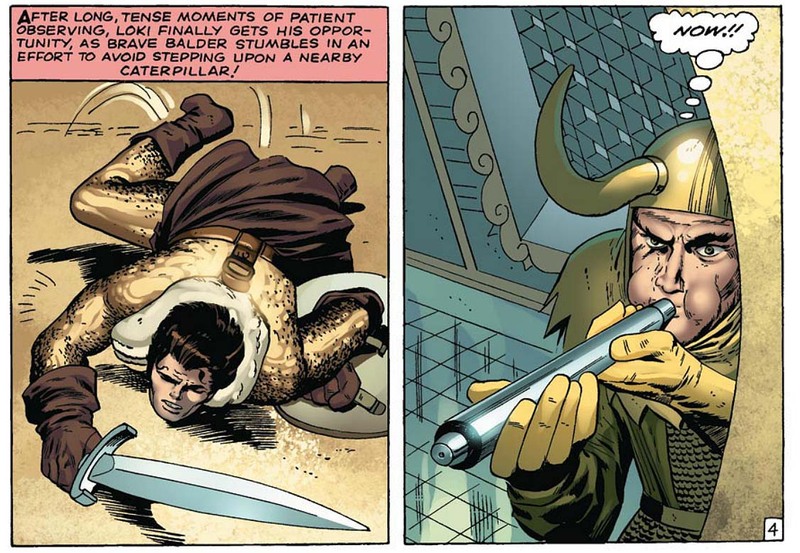 Then a few small continuing backup strips (usually about 5 pages long) started appearing - such as The Wasp in TtA, The Watcher in ToS, "Tales of Asgard" in JiM and Dr. Strange in (appropriately enough) Strange - but small backups remained for a while, even if just the occasional 2-page text story. Well, hang on to your hats, because next month that finally starts to change - and the three remaining anthology books will each become 50/50 split books, with one hero taking up the first half of the comic, and a second hero taking up the entirety of the latter. (Journey into Mystery will become solely a Thor book just by lengthening the lead.) So say your goodbyes to filler material now! Marvel will never really see its like again. "The madder Hulk gets, the strong Hulk gets"? A new era dawns for the emerald aggressor. But this split-book format, as mentioned, starts next month; Canny Stan was much too smart to launch the Hulk in a new feature completely out of the blue and with no lead-in or set-up. (Not a second time, anyway!) 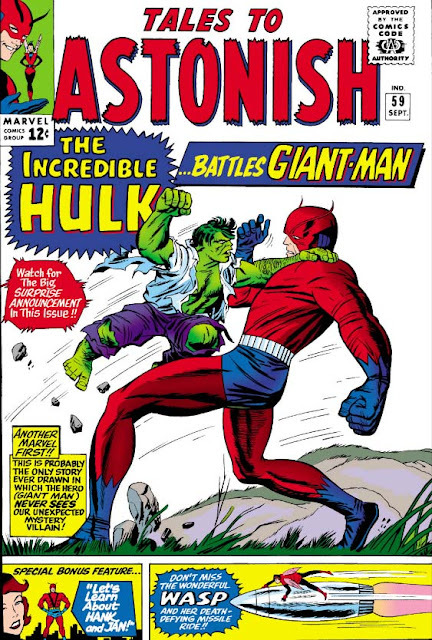 So Stan eases him into the title with an 18-page story which pits Giant-Man and the Wasp against the green behemoth! 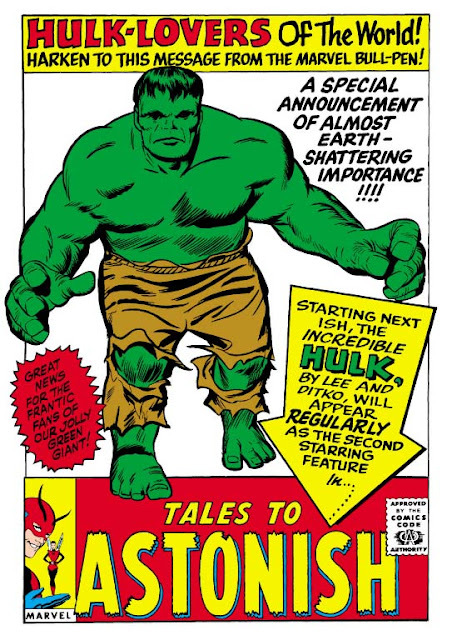 And yet what's really interesting is that the story functions incredibly well as a stealth pilot, not simply using the Hulk as a bland antagonist, but doing so in a story that contains and conveys all of the character's background and supporting cast: the New Mexico desert setting, the strained and lamented relationship between the Hulk and Banner, the way the monster is hounded by General Ross of the US Army, whose daughter Betty is enamored of the scientist Banner... All of the things that will be so central to the strip, as it goes forward, are quietly restated here - but because of the action that ensues, the exposition and back story never feel forced. This is disastrous! Somebody stop him! He's deliberately snubbing genre conventions! 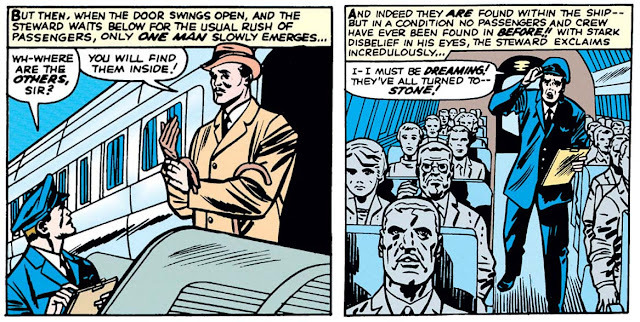 Hilariously, the story features not just Giant-Man, the Wasp and the Hulk - but also perpetually lame villain the Human Top! At first I feared that the plot might just recycle The Avengers #1, with the Top aiming the easily-manipulated Hulk at Hank & Jan, just as Loki had against them and the rest of the soon-to-be-team in that inaugural issue. Refreshingly, that isn't the case here; instead, Hank takes Jan to New Mexico because he feels bad about the Hulk having left the Avengers under such terrible circumstances, and wants to try talking him into joining up again. (It's nice to see Hank acting truly noble and selfless for a change, instead of arrogant and cocky!) That's when the Human Top gets involved, first following the pair on their journey to the Southwest, and only afterward directing the maddened Hulk at Giant-Man and the Wasp - and then aiming the US Army at the Hulk! The increasing escalation of all this chaos and hostility is so effective that for once it finally makes a nutty sort of sense when an atomic bomb is launched into the fray as well...! 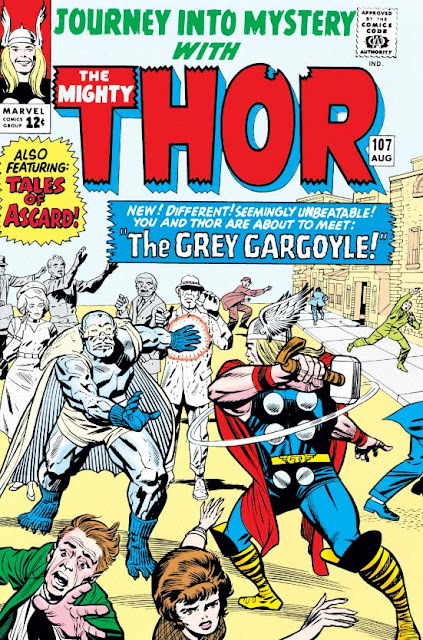 This issue sees the introduction of Marvel baddie The Grey Gargoyle - who, though he would never go on to become anyone's archnemesis, is still a decently solid villain. 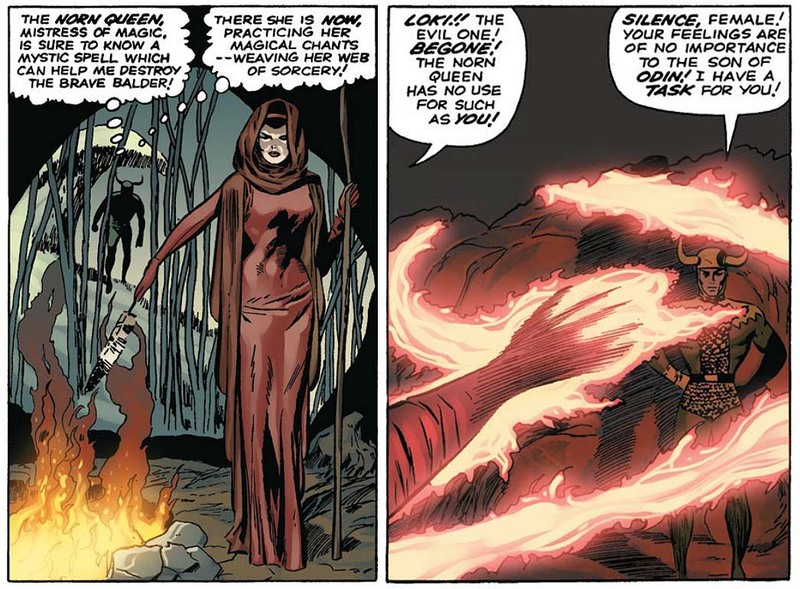 As implied by his name, the Gargoyle's fearsome power is the ability to turn anyone to stone with but a touch (albeit temporarily); refreshingly, this is one of the more unique superpowers to grace the pages, and not something we've seen a hundred times before. Oddly enough, despite his power's similarity to that of the Medusa of Greek legend, the character is instead named for the carved stone creatures seen to perch at the edges of buildings ... and yet the only time he's ever shown in that pose is on the opening splash. Wow! Now that is one creepy image. Meanwhile, the Don Blake / Jane Foster subplot which had been simmering the past several months gets a bit of resolution. When Jane happens to enter Blake's office just after he'd turned into Thor, he decides to cover by demanding the location of Blake, intent on making Don pay for having sold him out. 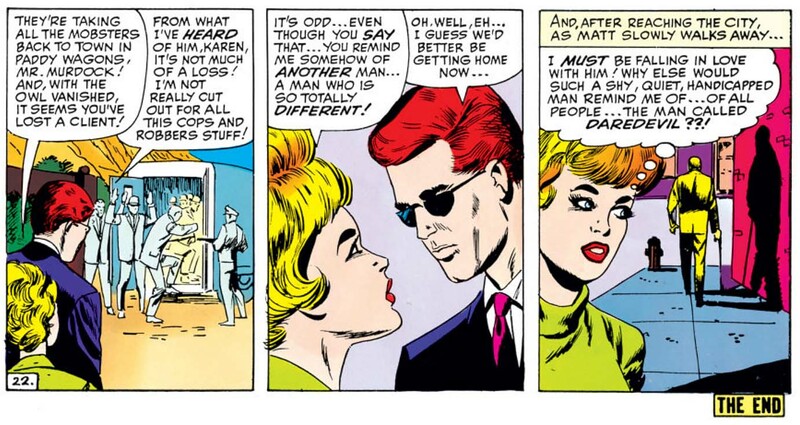 Not only does his ruse work, but Jane in fact pleads with Thor to spare Don Blake - because she still loves him, you see. Struck by this revelation, Thor flies out the window and immediately starts flying up and down the sky in joyful abandon, giving us one of the more cartoony sequences we've seen in the strip for some time. Is it silly? You bet. But that's not unappreciated! Thor does his best impression of Daffy Duck. Lest you think Thor's "She loves me! She loves me!" antics are the only break of levity to be had, the rest of the issue provides quite a bit of Goofy Silver Age Writing as well. Chief among them are the Gargoyle turning a paper airplane into a stone one and then hurling it into the wall, as well as the revelation that he's not covered in stone all the time - but rather, has to periodically touch himself all over in order to spread the stone effect across his body. (No mention of that hard-to-reach spot between the shoulder blades.) The coup de grace, though, comes when Don Blake requisitions a special "3-D type projector", mounts it to the front of a motorcycle, and drives all over the city to entice the Gargoyle to chase a flying hologram of Thor. Surprisingly, it works on GG for much longer than it should! The Norn Queen gets quite the portentous intro. Loki's expression, the mosaic on the walls... Breathtaking! In this issue, we see Daredevil menaced by the villainy of ... The Owl! The funny thing is that although the character seems somewhat ridiculous in design (and, in concept, certainly hasn't aged well over the years), he is here played up as a real and believable threat, thanks to the efforts of Stan Lee and Joe Orlando. And while he may not ever become an archfoe - both Bullseye and the Kingpin wouldn't be created until years later - he is still the first classic Daredevil villain to grace these pages. 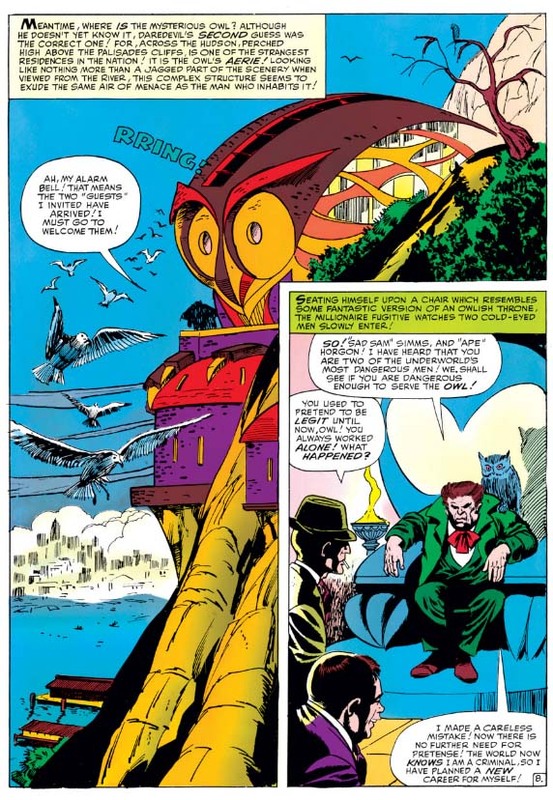 Interestingly, the surprising influence of Batman continues: After all, is the Owl here so very different from that other avian-themed crime lord, the Penguin? Yet another reason to enjoy artist Joe Orlando's stint on the title. The Owl's entrance is filled with a sense of mystery and menace! However, unlike the Kingpin (of whom, it must be said, this Owl seems protypical: a possible ur-Kingpin), our villain is not just a crime lord. Indeed, he can also fly! 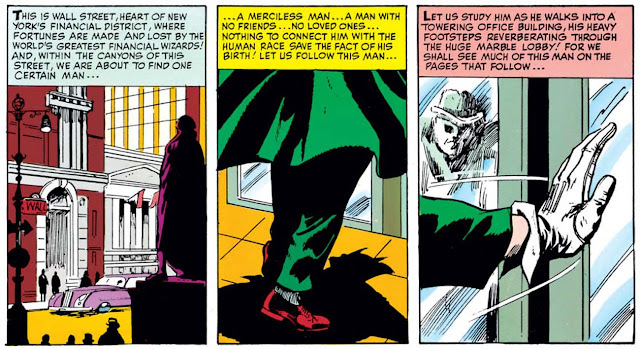 So he's quite like a white-collar version of the Vulture then, yes? Oddly, no explanation is given for his unusual talent beyond the rather vague ability to "glide with the air currents", which at a stretch is only slightly implausible on a cliff by the sea - and far more so in the city proper. Tellingly, it doesn't matter; perhaps Stan has realized that nuclear origins and technobabble are much less compelling, and much less interesting, than the colorful characters themselves. Either that, or he simply forgot! Hey, look - it's the start of Marvel merchandising! Needless to say, this cute little backpack doesn't last long. 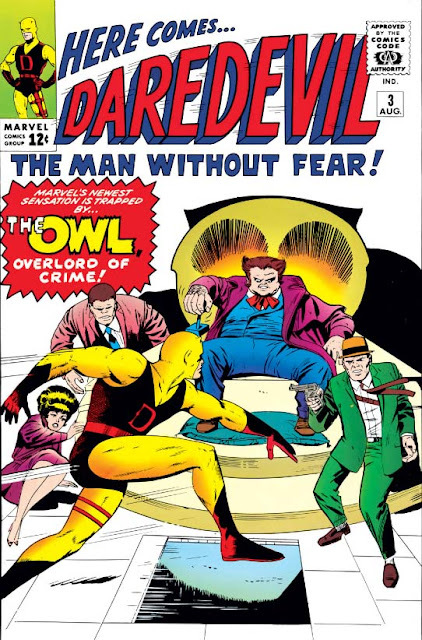 The Owl is introduced to us with an air of real menace, and Matt Murdock can even sense the criminal's evil intent upon their first meeting. So it's something of a surprise to see Matt and his law firm take the Owl's case! Although we're used to seeing the good guy as Defender of the Helpless, our hero waxes eloquent on the rights of every person to have a proper defense, no matter how obviously guilty they might seem. "If we attorneys refuse to help accused people because we think they're guilty," he muses, "then we're judging them without trial!" These are pretty heady themes for what's ostensibly a kid's comic; as ever, Stan avoids talking down to his readers. Despite the surprisingly effective villainy on display, this isn't the most complex or groundbreaking story. Once the plot kicks in, it's really just: Villain captures hero, hero escapes, they fight and the villain gets away. So it's perhaps a testament to the pairing of Lee and Orlando that the issue is a highly enjoyable one regardless! We get just enough personal moments with Daredevil to be really rewarding, and little details like the Owl's insane lair or Daredevil's new backpack give us just enough additional elements to spice things up. And Stan is mindful enough to have the Owl escape at the end; he will certainly be back...! They've got a real Don Blake / Jane Foster thing going here, don't they?